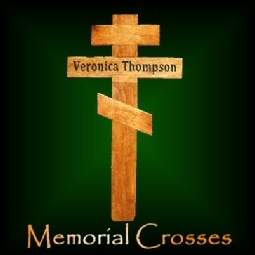 All of our crosses are made of poplar, cherry or maple woods and stained with your choice of colors. We also stain a dual colors such as red mahogany and golden oak. 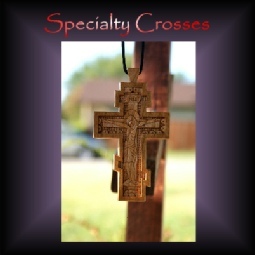 There are no templates used in the making of these crosses so each one is one of a kind. Tell me what you want and we will create it for you. 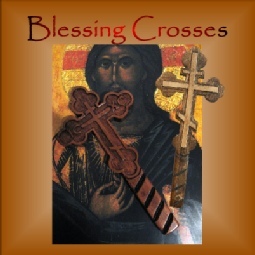 We offer several styles and sizes of crosses, from wooden crosses, wall crosses, unique crosses, heirloom, Handcrafted, crosses, crucifix, Orthodox, Catholic, baptismal, Chrismation, Christian crosses, gravesite crosses, memorial crosses, handcrafted, plaques, signs, orthodox cross, Russian crosses, Greek crosses, decorative wall crosses, roadside crosses, from 3 inches to 8 feet tall. 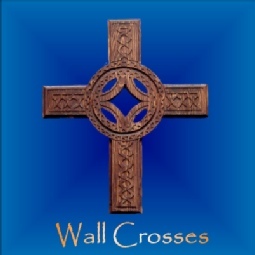 All our Crosses are made as ordered. These take from 1 -4 weeks to carve.